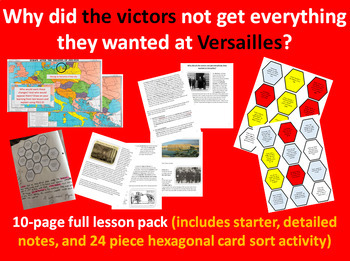 In this lesson students explore the reasons the victors left Versailles feeling that they did not get everything they wanted. To introduce the topic the class work through a series of map-based questions before proceeding to dig into detailed notes. The class then complete a 24 piece hexagonal card sort to answer the Key Question by breaking the evidence down into colour-coded factors. I hope your students enjoy it as much as mine do.